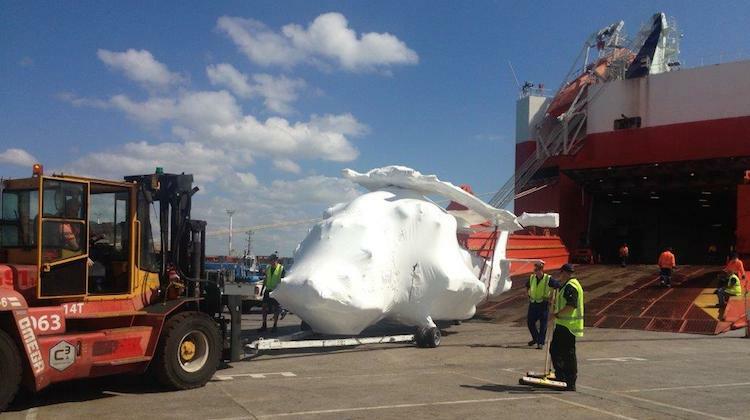 The first Kaman SH-2G(I) Super Seasprite helicopter for the Royal New Zealand Navy has arrived by ship in Auckland, as this image Tweeted on Thursday by the NZ Chief of Navy shows. New Zealand is acquiring 10 Super Seasprites, designated SH-2G(I) – I for International – to replace its five older SH-2Gs currently in service (and which in turn have been sold to Peru). Eight will be used operationally, while two will be broken down for spare parts. The aircraft were originally built on order for the Royal Australian Navy as the SH-2G(A), before that controversial contract was cancelled in 2008. Glad to see someone getting some use out of them. Another quick delivery for NZ. I’d love to see the log-books of some of these machines…..first built in 60s (? ), stored, rebuilt, a few flights, stored, worked on, maybe fixed, stored, test-flown, stored, returned to manufacturer, stored, rebuilt, stored, sent to NZ…..